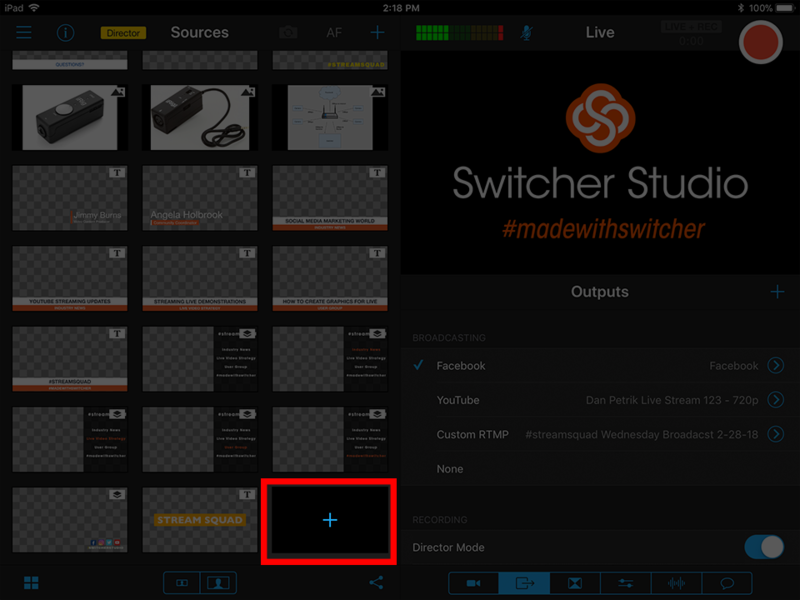 Switcher Studio video insertion enables creators to import recorded video into your Switcher Studio productions. Videos must be stored on the device’s Photos app to be accessible within Switcher, so make sure videos you want to use in Switcher are stored on your device (files saved in iCloud or your Photo Stream will not be accessible for insertion). To start this process, tap on the plus icon in the sources panel. 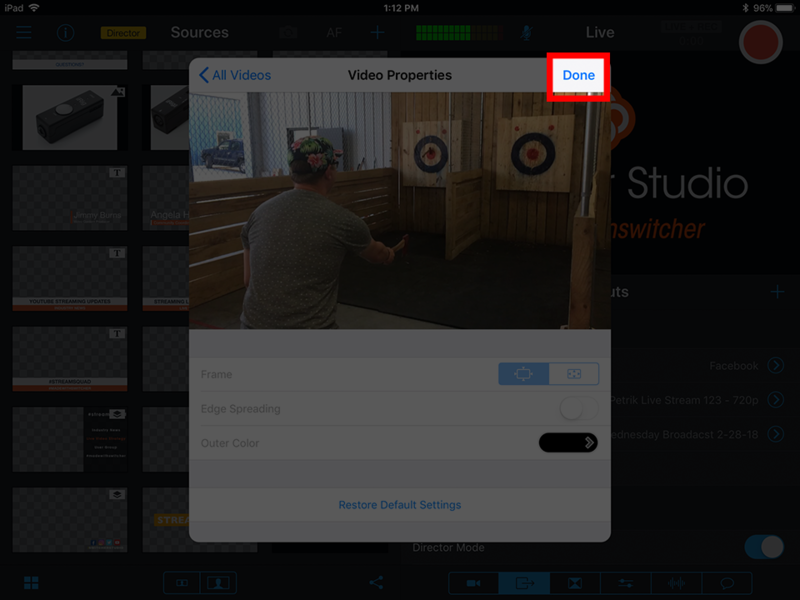 Now choose the "All Videos" option to open all the videos saved in the device's Photos app. Now, scroll through and find the video you want to add and tap on it. Once you have confirmed everything is right and the video is the correct one, tap done in the upper right corner. The video is now ready to be brought into your live productions. Most video files are accepted, but videos must be saved to your Camera Roll. Videos saved to your photostream or iCloud cannot be played. 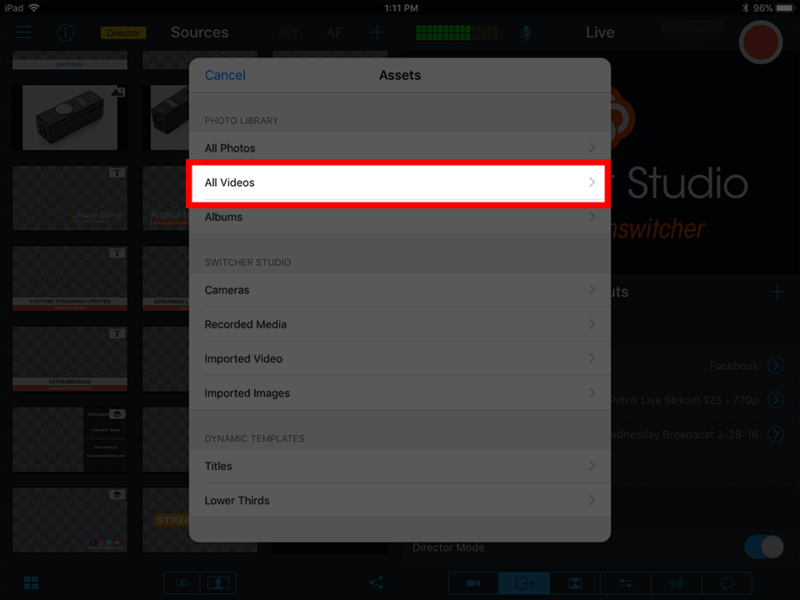 Currently, video files will auto play when selected and/or when moved from preview to live (iPad). After the video ends the screen will cut to black and you can switch to your next source. Any audio associated with the video will play when the video goes live. The audio from the video can be seen on the VU meter but will not playback on your phone's built-in mic to prevent audio feedback. If you need to disable your iPad or incoming audio and only play sound from the video itself, there is a new mute button at the top of the UI. This will not mute your video, only any incoming audio connected to your primary device. If you need to provide commentary or talk over your video you can leave the microphone unmuted (default setting). We will continue to improve video insertion with loop function, select section, audio controls, etc. in subsequent releases. As a word of caution, avoid rebroadcasting previously recorded content as though it were live. This is against Facebook's terms of service and could get your account flagged for misconduct. Good use cases for video insertion include show opener's, prerecorded testimonials/interviews, highlights/clips, b-roll and establishing shots, etc.. Thanks for your support, we look forward to seeing what you create!